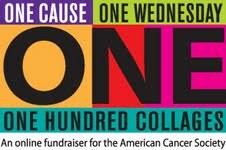 One Cause – The Fight Against Cancer. One Wednesday – February 16, 2011. Fiberart For A Cause has already donated over $205,000 to the American Cancer Society through the generosity of fiber artists and their patrons. Jamie, Always great to have your artwork for a fundraiser to fight cancer. Thank you! another lovely piece...love the tulips!